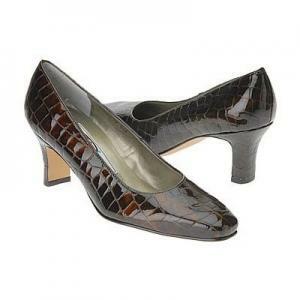 Uptown is a mid heel dress pump in Croco -the classic number one “goes with everything” pair of shoes of your wardrobe. Ros Hommerson is known for making most of their shoes with premium quality nappa, calf or kidskin uppers with anti microbial foam and padded footbeds, some with arch supports, and polyurethane, or rubber. Ros Hommerson’s widest range of sizes runs from 6 slim (S or AAA) and 5 narrow (N) to 13 extra wide (WW). With the highest quality leathers and true craftsmanship, Ros Hommerson footwear exemplifies the best in comfort shoes. Ros Hommerson shoes integrate comfort technology into impeccably designed styles. Season after season, Ros Hommerson sandals and boots are created with the most exacting standards, promising un-compromised quality and fit.